This Spinach, Bacon and Feta Breakfast Sandwich is an easy, make-ahead dish that’s full of fresh ingredients. Fluffy eggs are seasoned with creamy feta cheese, and then topped sautéed spinach and smoky bacon. 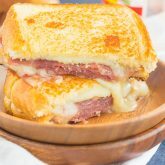 This sandwich makes a delicious and hearty breakfast for those busy weekday mornings! It’s back-to-school time, and I can smell it in the air. I’ve said this before, but I feel it’s worth mentioning again…I get the “back-to-school” feels this time of year. The air is just ever so slightly crisp in the mornings, kids are waiting at the bus stops, and it just smells like school when I walk outside. Call me crazy, but I’ve always felt like that, even though my school days are long gone. But, with school being back in session comes some wonderful things to look forward to! Not that I’m wishing away summer by any means (trust me, I’m not! ), but I am looking forward to cool, fall nights, pumpkin spice lattes (YES!! ), apples, and everything pumpkin. When one season winds down, I try to look at the silver lining in the next, and fall just happens to be my favorite. But, enough of that. It’s still summer! So, I thought I would share a back-to-school recipe that works perfectly for both kids and adults. You know, just in case you need some back-to-work inspiration; or your kids need a new breakfast that’s ready in no time. 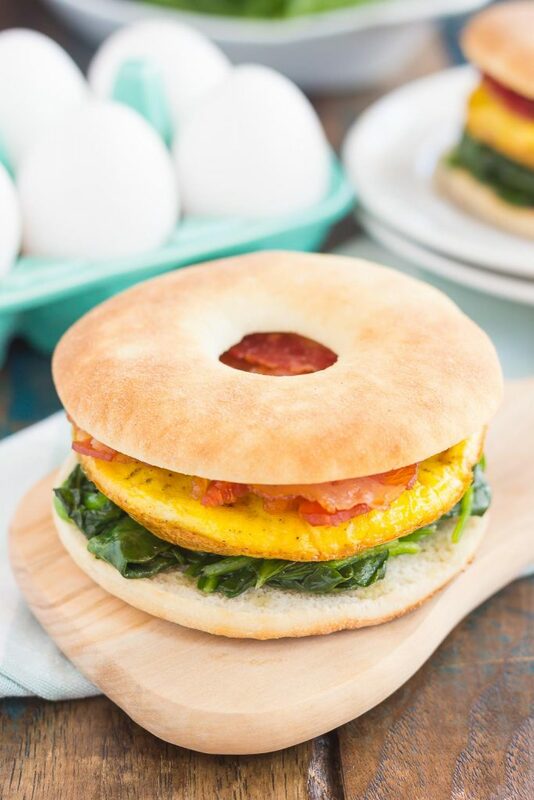 If you love breakfast sandwiches, then this was made for you. The fresh, sautéed spinach and feta cheese give this dish a creative touch over the regular kinds of breakfast sandwiches. And bacon, you just can’t forget about the bacon! It adds a nice crunch and smoky flavor, which complements the mild spinach and feta. And then there’s the eggs. 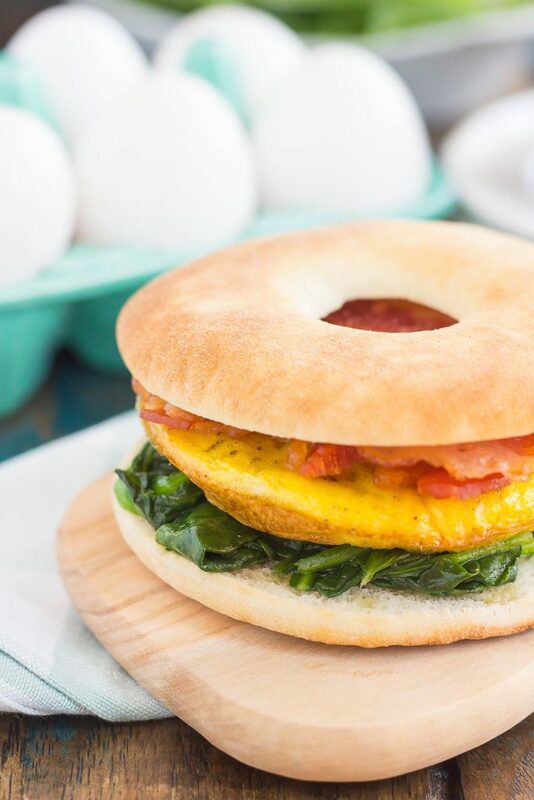 Want to know my secret for making these eggs the perfect size for a bagel sandwich? Prepare them in a mini pie pan and then bake them in the oven! It makes the eggs fluffy and just the right size to fit on top of bagels and English muffins. And the best part about this Spinach, Bacon and Feta Breakfast Sandwich is that it’s so easy to customize, depending on your tastes. If you don’t like spinach, leave it out! Like sausage better? Swap it in for the bacon. See what I mean? 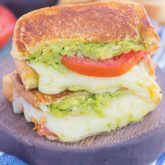 This breakfast sandwich is also great to prepare on the weekends and then refrigerate (or freeze) for an easy, grab-n-go option during the week. 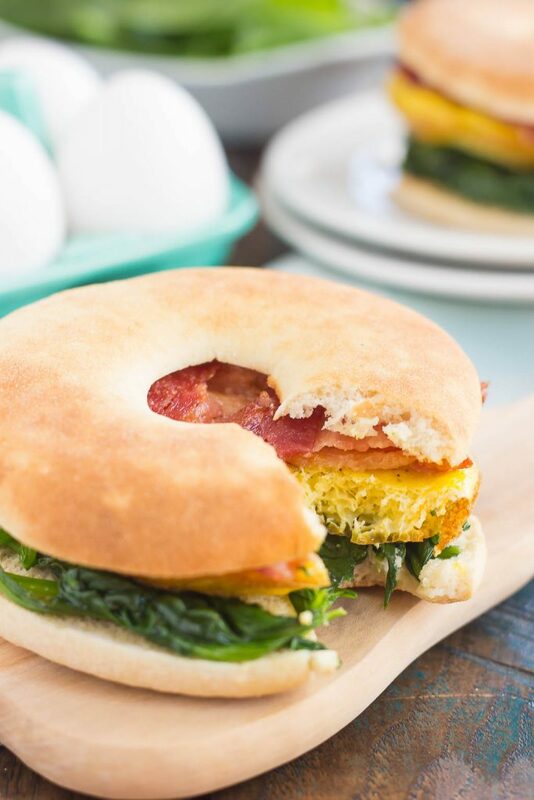 So, beat those back-to-school or work blue with this fresh and tasty Spinach, Bacon and Feta Breakfast Sandwich. One bite and you’ll be coming back for more! This Spinach, Bacon and Feta Breakfast Sandwich is an easy, make-ahead dish that's full of fresh ingredients. Fluffy eggs are seasoned with creamy feta cheese, and then topped sautéed spinach and smoky bacon. This sandwich makes a delicious and hearty breakfast for those busy weekday mornings! Preheat oven to 375F. Lightly grease 2 mini pie pan wells or 2 jumbo muffin wells with non-stick cooking spray. Crack one egg into each well. Sprinkle with salt and pepper. Lightly whisk to combine. Sprinkle feta cheese on top of egg mixture. Bake for 8-10 minutes, or until eggs are set. Remove from oven and let cool slightly. While eggs are baking, heat olive oil in a medium skillet. Add spinach and sauté until wilted. Remove from heat and set aside. 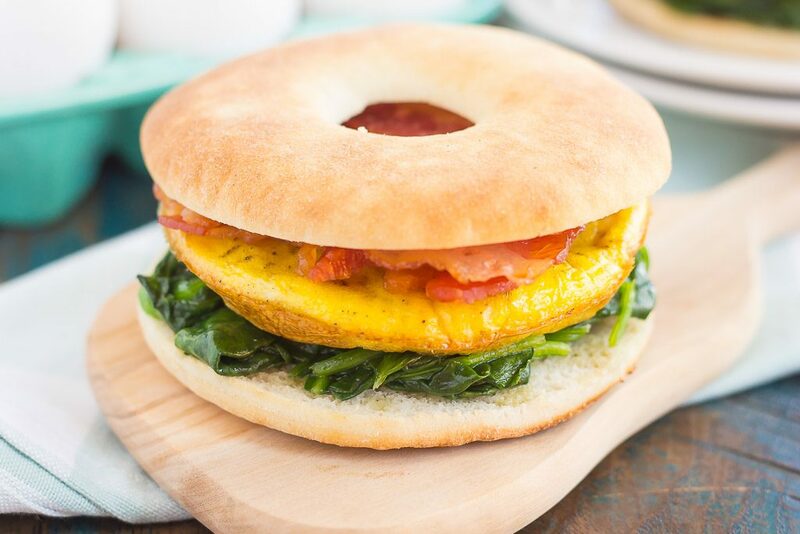 To assemble breakfast sandwiches, divide spinach evenly between two bagels. Top each bagel with the baked eggs, and two slices of bacon. Serve immediately, refrigerate, or freeze until ready to serve. This is my kind of breakfast Gayle! Anything with feta has to be good, right? Also, I love starting my day with spinach - it makes me feel much healthier. Yes! Anything with feta is a winner in my book! :) Thanks, Dannii! If you're a teacher like me, we greet this time of year with panic and sleeplessness. But it's still a fun feeling! Feta makes everything better. This breakfast sandwich is what I need RIGHT NOW to get through my morning of meetings. Tomorrow it's happening! I can imagine, Mir! I'm sure your glad the first day jitters are over. Thanks for the kind words, friend! Thank you, Jess! Feta and bacon makes such a delicious combo! I just LOVE that cooler , crisp feel that we get with Fall weather ! Plus, all the clothes, scents and flavours that go along with it :) I love a good breakfast sandwich and that mini pie pan idea for cooking the eggs is just brilliant! This is a fantastic combo; I bet a version with avocado would be delicious too :) Pinned! Have a fantastic weekend, my friend! Fall is the best...though I'm trying not to wish summer away! :) Oh I love your thinking of adding avocado...totally trying that next time. Thanks for the kind words and pin, friend! This sandwich looks perfect for breakfast! Love the spinach and bacon! This is a great way to start the day for sure! Thanks, Rachel! It's such a great combo! This is a perfect way to start the day! Love the addition of feta and spinach...and bacon just makes everything better! Since the weather here the past few days has been a little less brutal I am starting to get the feel-good-fall-feels too, Gayle! I will miss summer, but Fall has A LOT of wonderful things to offer!! These breakfast sammies are just perfect, girlfriend! They totally are giving me ALL the good feels! Love the feta, bacon, spinach and egg combo! Such great flavors and a delicious way to start the day!! Pinned of course! ;) Cheers! Sounds good to me! This is a brain-boosting breakfast! spinach and feta go so well together! I bet this tasted delicious! I'm so not ready for summer to be over, but in NC it's going to stay hot and humid for some time before things cool off. I'm always on the lookout for an easy grab and go breakfast, so this sandwich sounds perfect. Love the feta in here! I'm ready for fall, but I'm not ready for what comes after that here in the midwest! :) Thanks for the sandwich love, Rachelle! You know how to make one gorgeous breakfast sandwich! I'm having trouble thinking about saying goodbye to fresh berries, peaches, and tomatoes, but fall is my favorite season too! 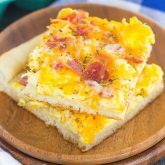 In the fall I think even more about make-ahead meals, and these breakfast sandwiches would fit so nicely into our morning routine! I love that they're freezer friendly and the feta and spinach sound fantastic in those eggs! Thank you, Marcie! 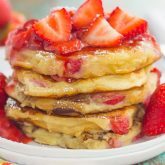 I love making freezer-friendly meals, especially when breakfast is involved! Thanks for the kind words, Demeter! It's a new favorite of mine and perfect for the freezer. Hope you have a great weekend, too! This sandwich looks perfect Gayle! need to make it for breakfast this weekend. I couldn't believe it is this time of the year, when I heard the school bus last week! School starts up again in two weeks for my lil guy so that means easy and filling breakfasts like this yummy sandwich are just we need! Yay for freezer-friendly, that makes them perfect for the hectic mornings to come. Love the spinach and feta combo! I can't wait for crisp fall weather too! I love fall because of the clear weather and the gorgeous colors! Add in this breakfast and I'm set!